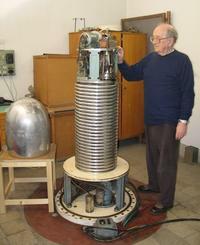 The ATOMKI cyclotron is the biggest accelerator in Hungary. 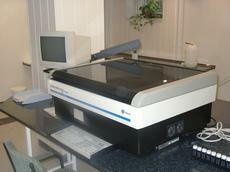 This is the only ECR ion source in Hungary. The installation of an electromagnetic isotope separator facility has been initiated to target a broad range of low-energy ion beam applications, which demand high-quality momentum and mass selected beams in an energy region of 100 V to several tens of kV. 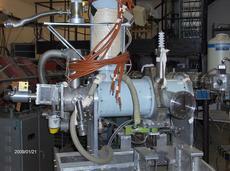 The facility provides positive single-charged ion beams formed of elements of both gases and solids. Potential ion beam applications may include the formation and modification of surface layers, implantation profiles, isotopically controlled structures and high-purity isotope enrichement for tracing studies. It is one of the most important fast neutron sources in Hungary. 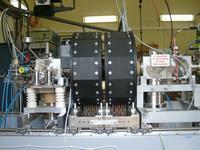 It operates at the MGC-20E cyclotron of ATOMKI. High intensity fast neutron fields can be produced by bombarding a stopping Be-target either with protons (p+Be neutrons) or deuterons (d+Be neutrons). The continuous spectrum of the p+Be neutrons covers the energy range En = 0-16 MeV. The continuous spectrum of the d+Be neutrons covers the energy range and En = 0-12.5 MeV. The neutron energy and intensity can be controlled by the energy and intensity of the bombarding beam. For 18 MeV protons typically 3x1011 n/s/sr intensity can be achieved at the 0o +/- 10o cone. study of neutron induced radiation damage of insulator and/or semiconductor based structures and photonic-electronic devices developed for operating in the radiation environment of high energy particle physics experiments, space and avionics applications and high counting rate applications. 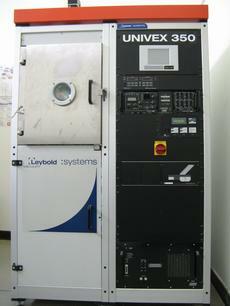 A nuclear analytical and a radiochemistry lab is also available. 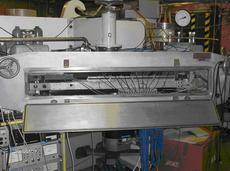 d+D fast neutrons are produced by bombarding a D2-gas target with deuterons. 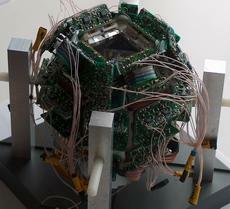 Quasi-monoenergetic neutrons can be obtained in the En = 3 - 12 MeV energy range. The neutron energy, the neutron intensity and the energy spread of the emitted neutrons can be varied by changing the energy and intensity of the bombarding beam and the pressure of the filling D2-gas of the target cell. 3 orders of magnitude of neutron intensity range can be covered. After evacuation of the target cell and changing its W beam stop plate to a thick Be disc it is also possible to produce d+Be neutrons with well known spectra at the same irradiation site and geometry. 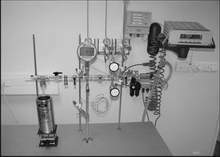 A pneumatic rabbit system is available for movement of the irradiated radioactive sample between the irradiation and counting positions. This enables cyclic irradiation and counting of activated samples when the activation processes lead to the formation of short lived radioactive products. The 78.8 cm inner diameter scattering chamber is equipped with 2 independently controlled wheel which can hold up to 10 silicon detectors. For the monitoring of the beam and target properties 2 additional detectors are mounted permanently on the chamber wall at ±15 degrees relative to the incoming beam. Up to 8 targets can be placed on the remote controlled sample holder. The target to beam angle and the height of the target can be changed as needed. Low pressure (P=5 mbar, isobutane) gas multi wire proportional counters, delayed line readout. Further information: Meas. Sci. Technol. 17 (2006) 84. 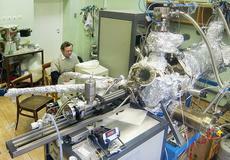 The laboratory consists of a cryotechnic supply system and low temperature experimental equipments. The most important part of the cryo-system is a KGU-600/15-150/4,5-40 type helium liquifier, which can produce 40 l of liquid helium per hour. 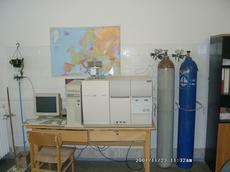 It is also connected with a gas collecting pipe system networked in most laboratories of the institute. The system supplies external users as well. c.) Built in tempertaure controlled measurement chamber: temp range 2÷300 K, controlled by low pressure He gas flow above 4.2 K, and circulated liquid He bath below 4.2 K.
Using magnetron sputtering techniques with UHV vacuum system we are able to produce metallic, semiconducting and insulating type thin films or multilayers with 2-3 nm individual layer thicknesses. Our main research area is the investigation of thermal stability of multilayers, motion and transformation of interfaces, studies of diffusional movement of atoms, and solid-state reactions in layered structures. 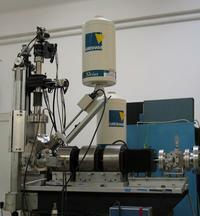 The Secondary Neutral/Ion Mass Spectrometry (SNMS/SIMS) is a suitable technique for depth profiling of surface coatings or multilayered structures (up to 1-2 nm modulation length), to analyse the depth distribution of impurities/doppants in semiconductor and polymer systems. With AMBIOS XP-I profilometer by measuring the vertical stylus displacement as a function of position we are able to measuring surface flatness, waviness and topography in nanometer vertical resolution with stylus loads from 10 mg down to 0.05 mg. The Laboratory provides a wide range of investigation possibilties for the micro and nanostructure primarily in materials science and technology applications and research. For microscopy measurements the necessary sample preparation units and the operating manpower and experience is also available. 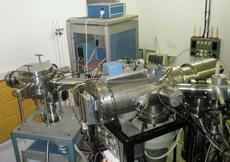 The laboratory can produce compund phase and unequilibrium, nanostructured materials and heat treatments. We offer regional service for companies and research institutes. Facilities marked with * are jointly operated by HAS-ATOMKI and the University of Debrecen. One of the subdivisions of the Section of Environmental and Earth Sciences is the Laboratory of Environmental Studies (LES), a multidisciplinary team dedicated to research in nuclear analytical methods, stable isotope measurements and systems technology. 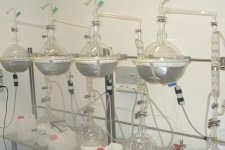 In operation for more than 15 years it has established a national and international reputation as a premier analytical laboratory, known for pioneering efforts in radiometric and stable isotope analysis techniques. It has considerable expertise in isotope measurements, radiocarbon dating, tritium measurements, monitoring activity around nuclear facilities and modelling of radionuclides in the environment, most of its projects being strongly related to the Paks NPP activity. 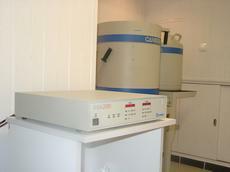 The VG-5400 mass spectrometer is suitable for determination of isotope ratios of all noble gases. 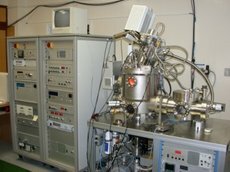 This is the first noble gas mass spectrometer in Hungary which has the sensitivity, accuracy and resolution required by various important fields of research, like environmental research, nuclear fission safety, waste disposal and geochronology. The sample inlet line is equipped with pneumatically activated NUPRO valves SS-4-BK, controlled by a computer. The line is made of stainless steel with UHV connections (VCR) with copper or aluminium gaskets. Four samples can be analyzed in a row without any manual intervention. 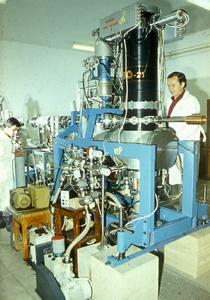 The line includes two vacuum units: one ion pump for the inlet section, one turbomolecular pump with its rotary pump for evacuating the purification section. This provides a high vacuum in the system (<10-8 torr). The pressure is controlled manually and via the computer at different stages in the system with Pirani and Penning gauges connected to the computer through an HP-IB interface. The purification section consists of an unfilled trap and a charcoal trap, placed in the same Dewar filled with liquid nitrogen, the level of which is regulated automatically by thermal sensors and an electrically activated valve connected to a liquid nitrogen tank. These two traps are followed by a SAES getter pump for removing the hydrogen. 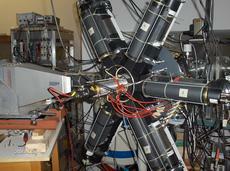 The mass spectrometer has a magnet of 90o deflection and 27 cm deflection radius with an extended geometry. The sensitivity is 1x10-3 A/mbar for Ar and 2x10-4 A/mbar for He. The resolution is adjusted to 600 which is sufficient for the resolution of 3He+, H3+ and HD+ beams. The abundance sensitivity measured as contribution from mass 40 at mass 39 is less than 0.5 ppm at 10-7 torr. The static vacuum level in the 1.3 l volume deflection chamber is 1x10-12 cm3 STP/min at mass 40. The various isotopes of an element have slightly different chemical and physical properties because of their mass differences. For elements of low atomic numbers, these mass differences are large enough for many physical, chemical, and biological processes or reactions to "fractionate" or change the relative proportions of various isotopes. Changes of isotope ratios can provide important information about the underlying processes. Natural isotope fractionation processes change the ratios only to a very small amount therefore very precise, high sensitivity measurements are needed. For the geological and hydrological applications a Thermo Finnigan Delta plus XP type stable isotope mass spectrometer is operated in the lab to study the five most important elements in geochemistry (S, C, H, O, N). We can determine the infiltration temperature of water, or the origin of sulfate or nitrate contamination of water. The measurement of carbon isotope ratios allows us to measure the presence of iso-sugar mixed in honey. 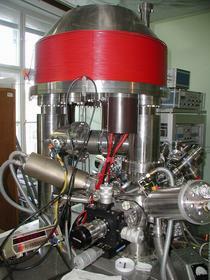 The quadrupole mass spectrometer equipped with a capillary inlet system is able to measure the main components of gas samples. Its range of analysis cover the interval from 1 amu to 200 amu. Weighting 45 kg it might be transported easily and applied in situ measurements. The resolution of the instrument is between 50 and 100 at mass 40. 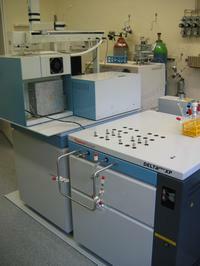 The spectrometer can be supplied with a membrane inlet system, which makes it suitable to measure dissolved gas in liquids. 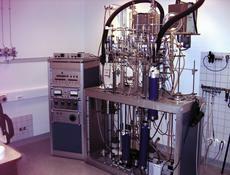 The instrument is devoted to pre-treatment of samples for stable mass spectrometry. The analytical method is based on the complete and instantaneous oxidation of the sample by "flash combustion" which converts all organic and inorganic substances into combustion products. The resulting combustion gases pass through a reduction furnace and are swept into the chromatographic column by the carrier gas (helium). The gases are separated in the column and detected by the thermal conductivity detector (TCD) which gives and output signal proportional to the concentration of the individual components of the mixture. The gas proportional counting system was developed for high precision radiocarbon dating and consists of nine electrolytic copper proportional counters of identical diameters with sensitive volumes of 0.35-0.73 dm3 and filled with CO2 at 1115 mbar and 2 bar. The inner counters are surrounded by an anticoincidence shield consisting of five multiwire proportional flat counters filled with propane. The pulses of the detectors are handled by integrated amplifiers, discriminators and anticoincidence units interfaced to a microprocessor-controlled data evaluation unit. Software is written in BASIC using ASSEMBLER sub-routines. 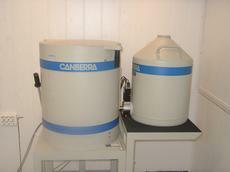 The overall precision of the system for modern carbon samples is better than 4  after a counting period of seven days. The time-resolved liquid scintillation counting circuitry employs a multiparameter multichannel analyzer (effective resolution of 1/10 keV), and three-dimensional analysis of both the prompt and afterpulses to discriminate between true beta events and background pulses. 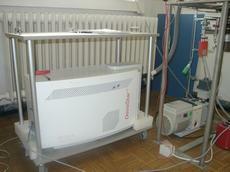 The instrument employs a bismuth germanium oxide (BGO) detector guard to lower backgrounds for 3H to 1.0-0.75 CPM, and 14C backgrounds to below 0.3 CPM. High sensitivity is achieved using less cocktail (reducing waste) - the E2/B ratio is about 800 for 3H and 6000 for 14C; limits of detectability are greatly reduced (less than 1 Bq/l of tritium can be measured in water samples in 500 minutes without enrichment). 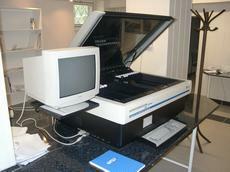 The instrument includes a built-in computer, which controls all system functions including sample changer, CRT display and data output. Dynamic color quench correction automatically corrects results for the optical quenching effects of highly colored samples, while the luminescence detection and correction feature automatically detects, quantitates and corrects for unwanted or unexpected luminescence in liquid scintillation samples. The LSC analyzer is equipped with a cassette-loaded bidirectional sample conveyor with sample capacity for either 408 standard 20 ml vials or 720 small 4 or 7 ml vials with Varisette sample changer for intermixing large and small vial cassettes without requiring special adapters. 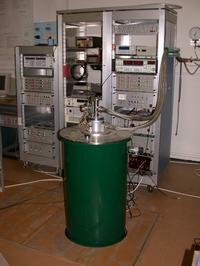 The HPGe γ-ray spectrometer (Canberra Model BE5030) situated in the underground low background laboratory of the Institute is equipped with a preamplifier (Canberra model 2002 CP) and an U-type cryostat. 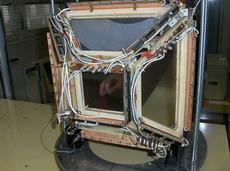 The detector has an active diameter of 80 mm and a carbon epoxy window with 0.5 mm thickness. The γ-ray spectral data are recorded by a multichannel analyzer (DSA-2000) processed by peak search and nuclide identification software (Genie 2000). The protection against cosmic rays and other background noises is realized by the 777B type lead shield. The dewar is located beside the shield and the horizontal arm extends through the side of the shield. As a part of an ongoing research project being carried out in Hungary to investigate the amount and temporal and spatial variations of fossil fuel CO2 in the near surface atmosphere we developed a mobile and high-precision atmospheric CO2 monitoring station. The measuring system is designed for continuous, unattended monitoring of CO2 mixing ratio in the near surface atmosphere based on an Ultramat 6F (Siemens) infrared gas analyzer. 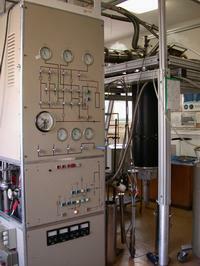 In the station one atmospheric 14CO2 sampling unit is also installed which was developed and widely used for more than one decade by ATOMKI. Using the FOCAM station we plan to determine the fossil fuel CO2 amount in the air of different cities and other average industrial regions in Hungary. 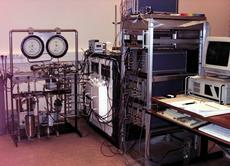 Radiocarbon dating by gas proportional counting has a long tradition in the Institute. Recently we would like to enlarge our 14C dating possibilities by purchasing of a Single Stage Accelerator Mass Spectrometer (SSAMS). To establish a modern AMS laboratory the whole lab building was completely renewed implementing an enhanced air filtration and conditioning system. The investment was financed by Isotoptech Ltd and supported by the Baross Gábor Innovation Programme. 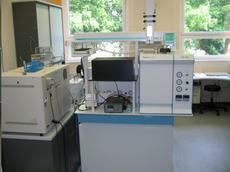 Sample preparation systems for AMS radiocarbon measurements are currently under development. The first Hungarian AMS graphite production facility was established in 2005 and the purity of the graphite was tested in CEDAD, University of Salento. Several sets of blanks and known-activity graphite samples were processed and tested in cooperation with the NSF Arizona 14C AMS facility in Tucson, Arizona. Although all of the graphite samples from ATOMKI were processed in a completely different manner than is usual at the NSF Arizona Lab, the mean value of the VIRI (Fifth International Radiocarbon Intercomparison) B samples measured by the NSF Arizona AMS is consistent with measured by gas proportional counting technique in ATOMKI and with the consensus value for this sample. The K-Ar method is suitable to determine the age of geological objects. The 40K izotope, that can be found in stones, decays with 109 years half life into 40Ar. Gamma photon energy 1173 keV and 1332 keV. radiotherapy applications: on line dosimeters, radiobiology experiments for studying effects of compounds having radiosensitizing or radioprotecting effects, etc. New knowledge in the fields of particle physics, planetary and earth sciences, space sciences, bio-medical sciences, radiation protection, radiotherapy. 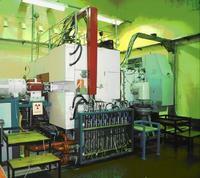 The Co-60 source is part of the national portfolio of irradiation facilities in Hungary. It contributes to the development of new competences, high value added products and services offered by domestic and international partners in the R&D&I and education and SME sectors. Radioactive isotopes produced on the 20 MeV cyclotron of the ATOMKI are chemically separated from the irradiated targets in the B-level Radiochemical Laboratory. From these radioisotopes radiopharmaceuticals can be synthesized for diagnostic (PET: 11C, 61Cu, 64Cu, 76Br, 124I; SPECT: 123I, 111In) and therapeutic (103Pd, 131Cs, 165Er, 169Yb, 186Re, 209,210At) applications. Part of these labeled compounds can be used also for agricultural investigations and animal diagnostics. In the laboratory we also perform catalytic and corrosion investigations as well as analysis of radioactive water samples. 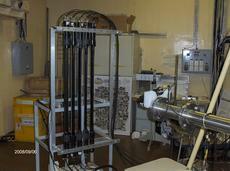 The laboratory is equipped with instruments and devices as well as sterile rooms for the above works. 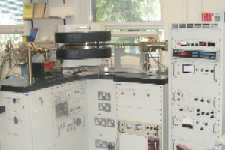 The B-level Radiochemical Laboratory is part of the ATOMKI Cyclotron Laboratory. In this laboratory submillimeter precise calibration procedures of the alignment elements of the CMS Muon System are performed. These calibration methods make use the combination of both the high precision industrial alignment technologies (LTD, photogrammetry) and the custom built electonics and informatics system designed for the CMS Muon Alignment Project. Devices that are calibrated there are able determine the position of the CMS Drift Tubes within the system of coordinates of the CMS experiment. Achieved precision of this position measurement is about 200 microns everywhere inside the full volume of CMS. Beyond the aforementioned devices located and used in the laboratory, expertise gained during the design, buliding and operatrion phase of the Muon Alignment System could be used in future projects on alignment.